Oatmeal Raisin Cookies were one of my favourite coffee house treats when I was in my teens. For some reason, the reference to oatmeal made me feel like I was eating healthy and I felt better about choosing this treat over say a double chocolate chunk cookie. Very silly now that I think about it considering the insane amount of sugar and other unhealthy ingredients that go into making the average coffee house cookie. All of that said, the smell and flavour of an oatmeal raisin cookie automatically transport me to my teens, where I would sit in a coffee shop for hours enthralled in serious girl talk with girl friends over lattes and oatmeal raisin cookies. 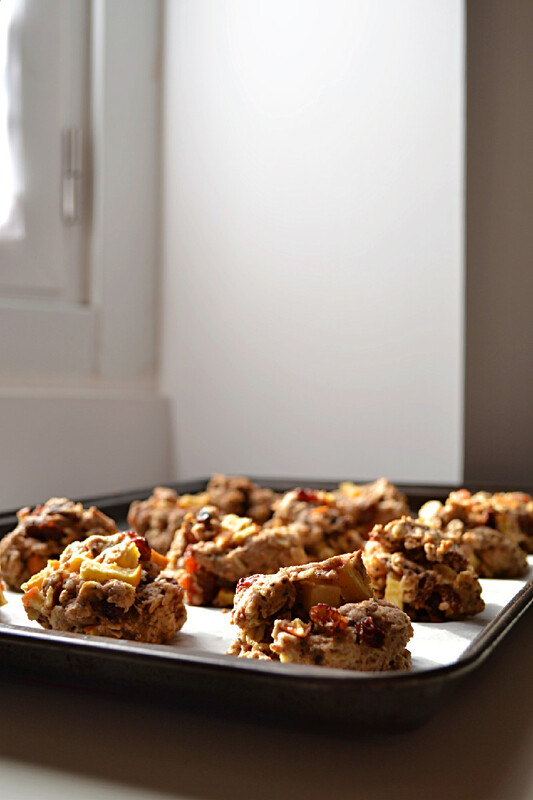 While we’re on the subject of girl talk, I had a tea date at my American girl friends house a few weeks back for which I made these cookies, a healthier version of the original classic, to which I added apples and a good dash cinnamon. The girls loved them and we polished them off over tea and a good dose of girl talk. You put together two Americans and a Canadian who are all married to Italian men and living in Milan, and trust me the conversations get interesting. The girls asked for the recipe and all I had to go on was memory. So, I decided I’d make them again and write out the recipe for them as I did and since I was doing that, I snapped a few shots so I could share them with you as well. So here they are for your enjoyment, with or without girl talk. 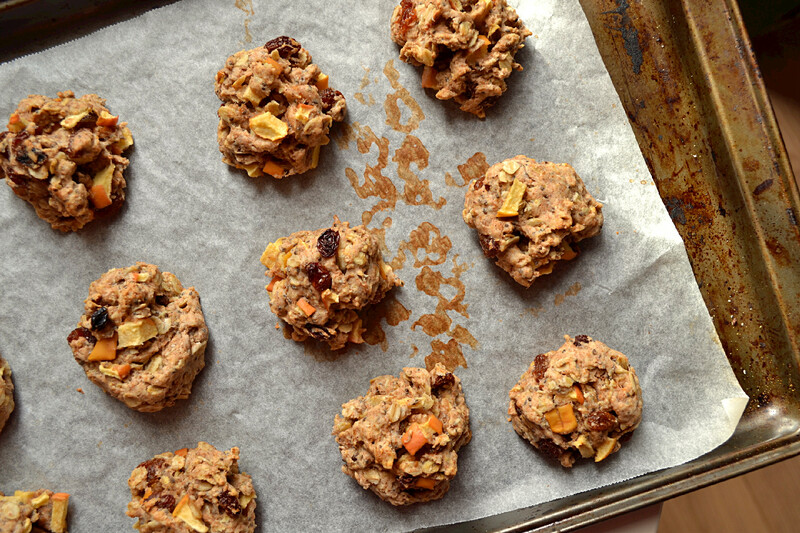 These cookies are a great snack or tea time treat. They’re soft and pillowy, with an intense cinnamon flavour and a natural sweetness from the apples and raisins, enhanced by a slight bit of pure Canadian maple syrup. Remove from oven and let them cool until they are not too hot to handle. Enjoy warm and store in an airtight container for up to 5 days. 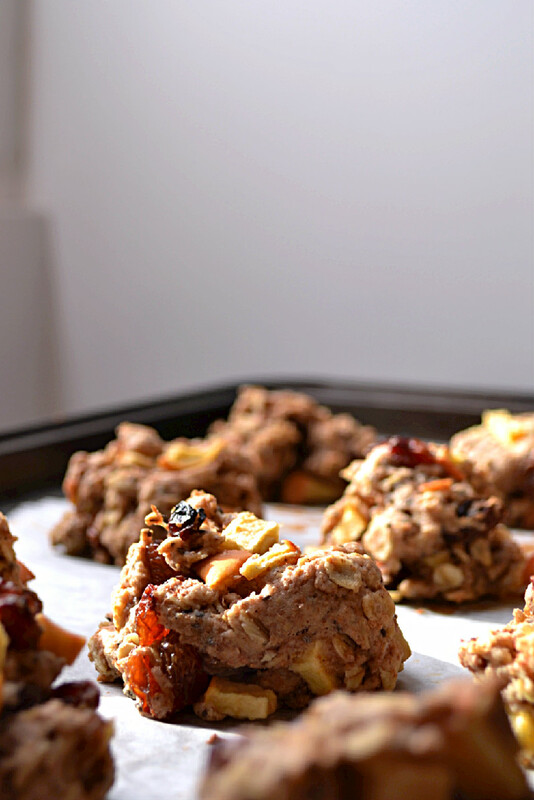 Oh my goodness, these look like such delish apple-y cookies. I love when you can see the real fruit in baked goods. Great post!